Cape-Town’s Foodeez describes itself as “South Africa’s leading provider of obsolete stock solutions”. The business, which trades under the name Foodies, has developed a loyal base of customers for its deeply discounted products. More and more suppliers are also seeing the benefits. Bruce Cohen spoke to CEO Dave Bester. When and why did you first start Foodies? My brother in law, Darren Mondry, started the business over 10 years ago focusing primarily on salvage goods that he was buying from insurance companies. He opened a small store in Parow and started selling these products directly to consumers at hugely discounted prices. His background is logistics. He saw an enormous amount of non-perishable food products being dumped because they were either short-dated or past best-before date. Any legal issues around sale of these products? According to legislation, it is not illegal to sell these products. Darren first approached manufacturers directly but there was significant resistance, primarily because they feared a backlash from consumers and the media to the notion of selling “expired” food products. But the business ticked over and started showing promise, so he opened a second store in Diep River. He felt that the business model had sufficient traction to grow but needed legitimacy in order to unlock this potential. At the time, the business was trading as Groceries Unlimited CC. I had recently retired after 28 years in advertising, so he approached me for help at the end of 2015. I worked with Darren for three months to gain a proper understanding of the opportunities. I saw the enormous potential, so I acquired 50% of the business, changed the name and started implementing a growth strategy. Your business background couldn’t be more different? 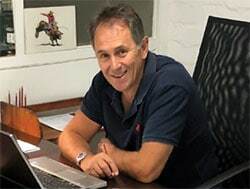 I was once a truck driver and also worked on a diamond mine in Namibia as an appi-geologist before starting an advertising career as a trainee at Ogilvy & Mather, Rightford Searle-Tripp & Makin. I was fortunate to be taught by industry giants: Bob, Brian and Roger. After seven years, I moved to Hunt Lascaris to head their Cape Town operation, before starting my own company, Bester Burke in 1997. What’s your core business philosophy? I believe in running a first-class business in a first-class way and that is my goal for Foodies. I don’t believe in beating around the bush, and dislike dishonesty intensely. I am as good as my word and I expect people or companies I deal with to be as good as theirs. I passionately believe in the concept of reducing food waste and spearheading the growth in shelf-stable food recovery as a viable alternative to dumping food. We have paid significant school fees in establishing and growing this business, and have overcome significant obstacles. We are paving the way for this concept, not just locally, but also globally. We were the first in the world to establish a retail chain specialising in distressed stock and will continue to expand the concept. • For cash-strapped consumers battling with food insecurity, specifically retired folk who are no longer economically active. We purchase the products directly from source and distribute it to our network of retail stores where we sell directly to consumers at significantly reduced prices – in most cases at about half the price of regular supermarkets. Our philosophy is simple – everything will sell at a price. We can move volumes of anything food-related, and have recently also starting adding various household products to our basket. Popular products include jams, sauces, coffee, canned veg and fruit, pasta, juice and confectionery…..